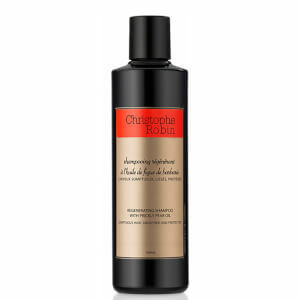 Ideal for highlighted, sensitive and coloured hair the antioxidant conditioner from Christophe Robin nourishes hair to restore it back to health. 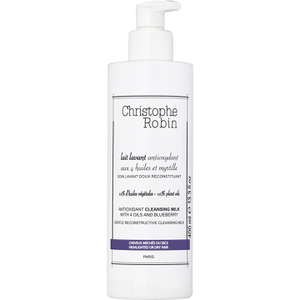 Containing essential oils and Blueberry extract for a caring conditioner that smooths hair, promotes colour life and shine. Aqua (Water), Cetearyl Alcohol, Glycerin, Ethylhexyl Stearate, Cetrimonium Chloride, Helianthus Annuus (Sunflower) Seed Oil, Plukenetia Volubilis Seed Oil, Prunus Amygdalus Dulcis (Sweet Almond) Oil, Prunus Persica (Peach) Kernel Oil, Guar Hydroxypropyltrimonium Chloride, Hydrolyzed Rice Protein, Vaccinium Myrtillus Leaf Extract, Citric Acid, Parfum (Fragrance), Tocopheryl Acetate, Retinyl Palmitate, Disodium Edta, Sodium Benzoate, Benzyl Alcohol, Potassium Sorbate, Tocopherol.